Every year, thousands of people receive Christmas presents in the form of donations in their name to organizations like Heiffer International, World Vision, Compassion, etc. It seems to me though, that most often the kind of person who tends to receive this kind of present is someone who is difficult to buy for- someone who already has everything they could possibly want. That 's why I thought it was really surprising when, this past summer, my parents chose to buy a goat for a poor family through World Vision as M's fourth birthday present. M definitely is NOT difficult to buy for- she has lots of things she would have liked! But how neat that my parents would trust a little girl to be compassionate and mature enough to be able to see this as a good thing. My mom also gave M a copy of the book Beatrice's Goat which tells the story of a family in Africa who receives a goat and is able to use the benefits from it to make a better life for themselves. It is told from the perspective of a young girl who would really like to go to school, but whose family cannot afford the cost of a uniform. My mom read this book with M and talked about it with her to help her understand the present. In the end, M did seem to understand, and she smiled and talked about it positively. I think it was really special that my parents would want to give M the gift of helping her to develop compassion and empathy for others. That's really an investment in her character, and something that could really make a lasting impression. 1. Look at the catalogs. 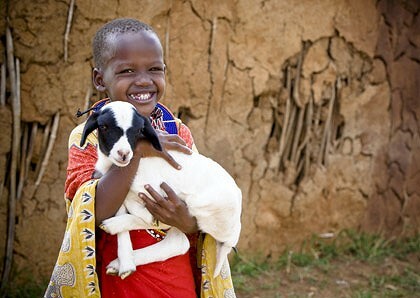 Many companies like World Vision put out catalogs of gifts like this that can be given to families all over the world. It might be neat to pore over one of these books with a child to pick out something together. 2. Pray for the family who will receive the gift together with your child. 3. Research the country or region where the gift will go and locate it on a map. 4. Buy a stuffed animal to match the kind of donation as a reminder of the real animal. 5. Encourage imagination. Let your child imagine what the family might name the animal, how they would feel upon receiving it, and what that animal might be doing, etc. Have you ever tried this sort of present with your children? What suggestions do you have? Partners International is another good organization that does this. I like the idea of giving the child a stuffed animal corresponding to the gift. And your other ideas as well. Food for the Poor is another good organization like this. We purchased gifts for teachers this year - "a child will receive school supplies in your honor"